CORBA Board of Directors member and Trail Crew Coordinator Hans Keifer has stepped down from his leadership positions, but his involvement with CORBA will not likely fade from memory any time soon, or ever for that matter. Whether it was his tireless work coordinating and leading trail work days on hundreds of miles of trails in the Angeles National Forest and Santa Monica Mountains National Recreation Area, or his calm and steady presence at board and public meetings, Hans has always remained focused on helping mountain bikers enjoy the open space trails by keeping them open and getting more miles dedicated to shared use. In addition to his advocacy work during his seven years on the CORBA board, Hans’ leadership helped to expand CORBA’s Fat Tire Fest (FTF) into more than just a celebration of CORBA’s founding. Under his leadership from 2003-2005, FTF went from a “Birthday Bash” to a full-on regional event for the mountain bike community. Hans’ involvement with trail work even led to a career change. In 2009 he became a professional trail building contractor when he purchased Bellfree Contractors, Inc., a respected company incorporated in 1987 and in business for more than 35 years. A well know trail constructed by Bellfree Contractors is the New Millennium Trail in Calabassas. Hans’ work can be seen literally all over the mountains; one of his crowning achievements as a volunteer was helping to build the Ken Burton Trail in the Angeles National Forest (ANF), as well as the many hundreds of hours spent repairing the trails in the ANF after the Station Fire. (Go here for a story on Hans’ work on the Ken Burton Trail.) “I get a great feeling of pride to ride or hike a trail that I had a part in building, repairing, or maintaining. I think everyone should experience that feeling,” says Hans. Hans will be missed, but he will not be far from the action. Whether it’s riding with his local mountain bike club OTB, or serving as an advisor to CORBA’s Trail Crew activities, we’re sure the best place to look for him is on the trail. We have completed the pipeline work and currently demobilizing the equipment. We should be out by Friday and the Canyon will be re-open to the public as of Saturday, 12/18. This took longer than anticipated, and the rains we experienced delayed our construction. CORBA and IMBA founding member and Mountain Bike Hall Of Fame Inductee Kurt Loheit was recently the recipient of American Trails’ Lifetime Service Award as part of the 20th American Trails National Symposium. The National Trails Awards is one way American Trails recognizes the exemplary people across the landscape of America who are working to create a national system of trails to meet the recreation, health, and travel needs of all Americans. This award recognizes an individual demonstrating long-standing, significant, and exemplary service to trail planning, implementation, and recreation. Kurt Loheit has more than 20 years of experience as a passionate outdoorsman, who has been instrumental in organizing and leading trail programs with the Palos Verdes Peninsula Land Conservancy and numerous other organizations across the nation, including the California Trails and Greenways Conference, founding the Los Angeles Chapter of Concerned Off Road Bicyclists Association, and being the Resources Director of the International Mountain Bicyclist Association. 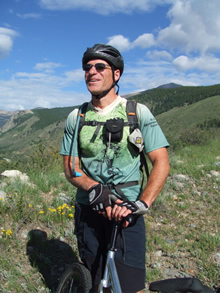 Kurt has been a leader of the hiking and mountain bike community’s efforts to contribute to the design, construction, and maintenance of sustainable trail systems. He has supervised trail projects and trail building schools around the country, he’s written about trail building issues in a number of mountain biking and land management publications, and he’s presented many times at national, state, and local trails conferences. 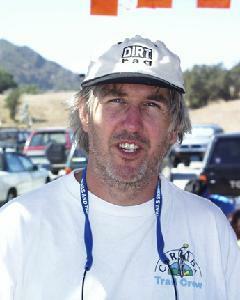 In 2004 he was inducted into the Mountain Bike Hall of Fame. As one of CORBA’s “elders,” Loheit continues to provide guidance on trail related topics, from maintenance projects to advocacy concerns on both a local and national level. A resident of Rancho Palos Verdes, he has been instrumental in the ongoing transformation of the open space trails into cooperative shared use. Says CORBA Palos Verdes member Troy Braswell, “When cyclists in Rancho Palos Verdes were on the verge of being completely shut out, Kurt stepped forward to put us on the right course. He guided us from a disorganized bunch of ignorant bikers to a band of pretty effective CORBA PV warriors. We congratulate Kurt on this lifetime service award, and express our sincerest gratitude for his ongoing contributions to CORBA, mountain biking and trail user communities around the nation. On November 10, CORBA Board members Mark Langton, Jeff Klinger, Hans Keifer, Danusia Bennet-Taber, and Steve Messer, along with Jim Hasenauer of IMBA and Bryan Gordon of the Canyonback Alliance, walked/rode the upper section of Rogers Road Trail with Topanga Sector Superintendent Lynette Brody and Maintenance Supervisor Dale Skinner. This tour was arranged by CORBA with these State Park employees in response to intense public input regarding recent work performed on the “re-route” (singletrack) section of trail (west where it meets Temescal Ridge Fire Road) as well as about a mile and a half of the wider road bed to the east of the singletrack. In the past few weeks, Supervisor Skinner has used a Sweco trail tractor/dozer to fix and install several drainage channels, as well as bring the trail up to vegetation clearance guidelines for multiple use, specifically, equestrians. Many local trail users have complained to State Parks that the work was overdone and that a once narrow, serene singletrack trail has been obliterated into a road. There are actually two separate sections, the “re-route” which was built as a true narrow trail, and the main Rogers Road Trail, which was originally a road cut that supported wide and heavy equipment. Earlier comments on CORBA’s web site began by trying to assuage concerns of trail users not familiar with this kind of work by saying that typically trails “come back” to a more natural state after a couple of seasons. This can be said for the “re-route” section, although CORBA noted to Supervisor Skinner that the widening created a “faster trail” and suggested that possible speed control devices such as pinch-point structures be considered. As for the wider section, based on the tour that took place on November 10, CORBA’s original comments were premature. After witnessing the complete section of the work area and hearing comments made by Supervisor Skinner, as well as an evaluation by professional trail contractor Hans Keifer, it is evident that the work that was performed lacked forethought and consideration for minimal impact. In fact, no Project Evaluation Form (PEF) was submitted for this work and therefore is in direct violation of the department’s own policy. We were assured by both Superintendent Brody and Supervisor Skinner that the work will not continue until a Project Evaluation Form is completed and that trail users will have a say in the process, which they said could take several months to over a year. It’s true that after new construction or trail maintenance, trails look bare and lose their natural character. Typically, Spring rains create new vegetation which helps the trails recover some of their more natural character. This has been our experience on several agency trail maintenance projects in the past. In the case of the recent work on the wider section of Rogers Road Trail there was a fundamental disagreement between the State’s position that Rogers should be maintained to “road” standards and that vegetation should be cut wider than the 8-foot wide/10-foot high vegetation clearance suggested by multiple use guidelines–and CORBA’s position that Rogers is a trail (the Backbone Trail), not a road; that the 8-foot/10-foot clearance was for new trail construction, not existing trails, and that the trail should be left as narrow and natural as possible while addressing and achieving the maintenance concerns of water drainage and a proper vegetation width for shared use with equestrians. We acknowledged that this is a multi-use trail that must work for all users and that there are several drainage and maintenance issues that are beyond the scope of handwork. We demonstrated how anything more than an 8-foot clearance wasn’t necessary for safety or sustainability and that in many cases the clearance that has been done was far wider than eight feet. CORBA’s position is that this work went too far and urged State Parks to minimize the impact of the maintenance on the only bike-legal singletrack in Topanga State Park. We were informed that the plan was to continue the work down to the Will Rogers State Historic Park Trail Loop, and we also expressed serious concern about continuing these impacts into what is admittedly an eroded and deteriorating section of trail. Superintendent Brody and Supervisor Skinner reiterated that moving forward, greater evaluation and a full PEF would take place and could take several months to over a year. Examination of the new/refurbished drains that were installed shows minimal attention to corrected out sloping to facilitate proper drainage; drains were basically cut with only a few passes with the Sweco’s blade and very little additional shaping or contouring was evident. On another section of trail, an entire corner (approximately 250-300 square feet) was scraped clean of vegetation, with the reason for the denudation being “ it’s for the hikers. Hikers like the beautiful views.” This brush clearance ignores the fact that it created a large, bare, disturbed area of unprotected, easily eroded earth that will exacerbate hydro erosion because there is no root system to control runoff. Also, there was no drain installed at the bottom of the hill where water would run to from this bare area. Another section of trail further south was smoothed of ruts and out sloped correctly. However, the width of the tread was increased to approximately 12 feet, far more than what CORBA considers appropriate or necessary. Again, we were assured by both Superintendent Brody and Supervisor Skinner that the work will not continue until a Project Evaluation Form is completed and that trail users will have a say in the process. Check back here for further information as we get it. There will be several opportunities to get involved as trail planning in Topanga State Park and the rest of the Santa Monica’s moves forward. We encourage you to get involved with your parks’ planning process and be proactive in shaping park policy, planning and landscapes. More than 25,000 people have added their names to Rails-to-Trails Conservancy’s (RTC) petition calling on the American Automobile Association (AAA) to support the programs that fund trails, walking and bicycling. Since we launched this campaign, AAA chapters from around the country have asserted that they do support trails, walking and bicycling. But if AAA Mid-Atlantic’s position on federal transportation funding were implemented nationally, the effect would be devastating to the trails, walking and bicycling movement. It doesn’t matter where you live, or whether you are a member of a particular chapter of AAA. Such a federal policy change would affect everyone. We want AAA National to disavow AAA Mid-Atlantic’s call to eliminate the funding of our programs through federal transportation dollars. Since 1991, these successful programs have helped build more than 19,000 miles of rail-trails and many thousands of miles of other bicycling and walking facilities around the country—likely including your favorite pathway. Help spread the word! Pass on the petition to your friends and family by asking them to visit www.railstotrails.org/AAA. For those of us who have linked our Ralphs Club Card to support CORBA, Ralphs requires that we reregister on an annual basis, on or after September 1st each year, so that they continue to contribute to CORBA. Please register or reregister your Ralphs card now! To learn more about this program, see these details. Take a Kid Mountain biking event registration is now open. 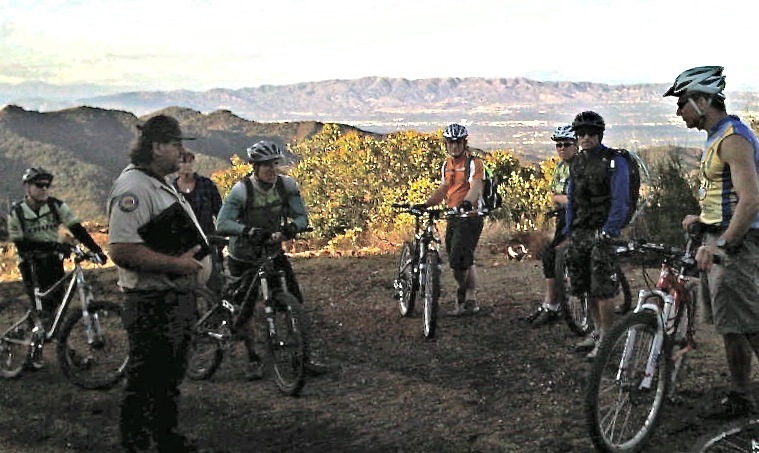 On October 2nd, in conjunction with the IMBA Take a Kid Mountain Biking Day, Concerned Off-Road Bicyclists Association will be having a fun ride at Malibu Creek State Park at 9:00 am. This will be a ride and rock climbing followed by a barbecue. All ages are welcome! This event is FREE so bring your own kids, nieces, nephews, friends kids, neighbor kids! Kids must have their own bikesand helmets. Not sure what to expect? Take a look at the 2008 or 2009 photo gallery of the event! Join us on Saturday 9/4/10 as we continue our brush work of this popular trail. The trail has become very overgrown since the winter’s rains and we need your help to clear some of this brush! Details are on the calendar. On July 28, Jim Hasenauer and Jeff Klinger attended the second General Plan Meeting for Topanga State Park. It is important that riders weigh-in on this process and view the planning website at: http://www.parks.ca.gov/default.asp?page_id=25956. 2. Mountain bicyclists have enjoyed Topanga since the very first days of our sport. One of the early mountain bike pioneers, Victor Vincente of America, developed his prototype “Topanga” mountain bike there. When CORBA was formed in 1987, it was partially in response to the closing of singletracks in Topanga State Park. Mountain bicyclists want equity of trail experiences, diversity of trail experiences, and connectivity of trails. The plan will influence each of these for many years, so it’s important that you submit comments now. Equity of trail experience – If you ride Topanga, you know that on any given day, most of the trail users are on bicycles. In contrast, we’re only allowed on less than half the trails/roads. All singletracks, with the exception of Roger’s Road, are closed to us. It’s fine to have one or two singletracks “hiker only,” but it is not fair to have all but one of them closed. An early descriptive statement on the Planning web page says “singletrack trails host hikers and sometimes equestrians.” It’s time for this to change. Let the Park Service know which singletrack trails would be important to you. Ask them to open them. Another concern is that the park is considering “natural and cultural preserves.” In most cases, preserves ban bicycles. We are, of course, committed to protecting these wild and significant areas, but there should be bicycle access to and through these preserves. Diversity of Trail Experience—Mountain bicyclists, like other outdoor recreationalists, are diverse in our interests and abilities. Topanga riders range from beginners, including children first learning to ride, to skilled, technical, even professional riders. The one size fits all view of “fire roads yes/singletracks no,” does not serve the public’s recreational needs. Our highest priority for the Santa Monica Mountains has always been access to the entire length of the Backbone Trail. In Topanga, Hondo Canyon and the Musch trail are sections of the Backbone that mountain bikers want open. In the planning meeting, they presented a “Visitor Based Camping and Trail Map” that shows the Hondo Canyon section of the Backbone open to bikes. We need to support that. It is true that not everyone could ride all of the Hondo Canyon trail without walking, but that doesn’t mean it should be closed to us. In fact, part of the experience of mountain biking is the adventure of exploring new trails and to hop off and hike-a-bike sections that are too steep or technical for our abilities. Land managers don’t seem to understand this concept, or mountain bikers in general. The Musch Trail is a significant missing link in all of their plans. There’s a trail camp there, which we need access to. The Backbone Trail is the most significant, long distance trail in the Santa Monicas. It should be open to us. The Plan also envisions a major trailhead for the Coastal Slope Trail, a long distance trail on the ocean side slope of the mountains. This too must be multiple-use. Connectivity of trails – There are at least two major obstacles to connectivity in Topanga. The first is the cyclist missing link to the Backbone mentioned above. The second is bike access to Temescal Canyon. Over the last several years, Temescal Canyon has become the site of regular meetings, seminars, interpretive events, family activities, etc. Those of us coming from the San Fernando Valley side cannot get there by bike. That’s particularly frustrating because there are two trails that go from Topanga State Park to Temescal and one trail that goes from Will Rogers State Park to Temescal. All three of these are closed to us. The Visitor Based map indicates that the Temescal Ridge Trail would be open to bikes. This is significant and needs to be supported. Vehicles on dirt Mulholland – State Parks is considering allowing cars to drive along dirt Mulholland in the Mulholland Corridor Zone (see map). We oppose this. Note that it does not have to be either “visitor based” or “preservation based,” it can be a mix of both.